Scott Monument is an imposing and somewhat unusual structure part of the Princes Street Gardens, Edinburgh. The hecklers deride its appearance as an object pulled from the top of some European cathedral and plonked on the ground. Others simply marvel at its simple design but intricate detail. 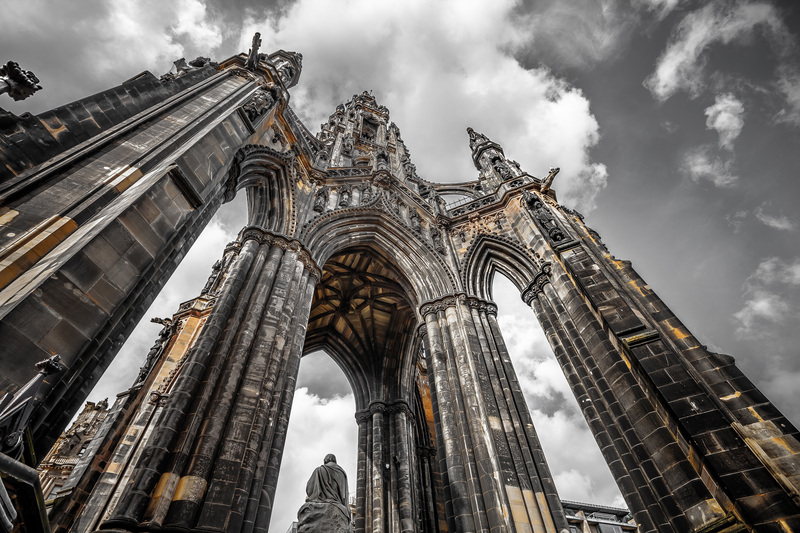 The monument itself was commissioned in 1838 to celebrate the life and achievements of Sir Walter Scott, one of Scotland’s most celebrated authors and poets. The architect who won the competition for the monument’s design, George Meikle Kemp, was self taught and used a pseudonym for fear his lack of qualifications would discount his entry. His design however was filled with the characters from Scott’s work in addition to the usual gothic effigies and was chosen as the popular choice. It would have been nice to simply say ‘beam me up Scotty’ but instead we climbed to the very top, all 287 steps up a series of progressively narrowing stone staircases to around 60m. The last section was so narrow you had to step sideways just to fit. Our effort was rewarded with stunning views of the old town and Castle Rock to the South and a panoramic vista of the Edinburgh heading out in every other direction.